Provides customer transactional information used in calculating commission. Figure 3.1 Affiliate Transactions Panel. Click transactions to view Transaction details and History. Click to Export all Transactional Data in to CSV format. Displays Earned Commission grouped by period. Figure 3.2 Affiliate Commission Panel. Click to View details about earned commission. Displays how many times referral links have been clicked by Clients. Figure 3.3 Affiliate Clicks Panel. Displays all customers signed up using Referral URL and Connected to Affiliate Account. Figure 3.4 Affiliate Customer Panel. Click Customer Number to Set Global Filter and View History. Figure 3.5 Agent Users Panel. Click to view user change history. Displays all current Open Support Tickets and allows the management and support of customers. Filter according to Customer, Agent or Partner. Search for Tickets using Keywords. Click to edit Canned responses. Click to show all previously closed tickets. Change Billing and Log in Information. Figure 3.7 Agent My Profile Menu. Fill in Email address to use as username. 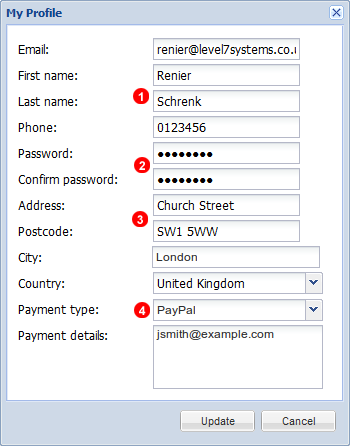 Select Payment type and fill in account details.